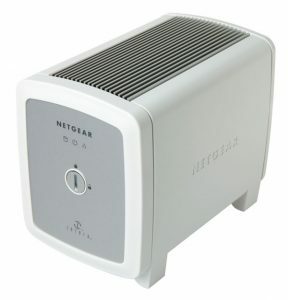 This is the Netgear SC101, a budget (60 quid) SAN device. It takes two hard drives which it presents as storage to any client on the network running the Netgear software. Out of the box you can allocate storage to multiple drive letters, or even set up a pair of mirrored disks to protect your data. What you can’t do, however, is create a spanned drive set – using all the space on both disks as one big volume. We (Phil and I) took two 300Gb disks and loaded them into the SC101, then installed the software on his laptop. Using Netgear’s configuration tool we allocated all of each disk to a drive letter – that gave us two drives (E: and F:) each of 279.3Gb. Those drives would also be available to any other user with the Netgear software installed on our network. But we’re not that fussed about multiple users being able to access the storage, what we are interested in is creating one massive volume for storing media. So, we uninstalled the software from Phil’s laptop, and installed it on his media server. Again, it created E: and F:. I opened Disk Management and deleted those partitions, then converted the basic disks to dynamic disks. Once that was done I could create a new spanned volume using those unallocated partitions. Voila! Big disk! The beauty is that when Phil gets another SC101 we can do the same thing and expand the existing storage non destructively. We are trading the benefit of a SAN (multiple users off a networked device) for the ability to span the disks, but in our case that’s an acceptable trade off. Why, you may be asking, didn’t we just fill the machine full of hard drives if we wanted lots of storage? Well, we already did that… the system already has 1Tb of storage, this is for the overflow! Went for a Terastation – RAID 5 on 5x 300gb disks plus the option to backup to any other. No client software needed, AND works with a UPS for a clean shutdown if power is lost.